Nina Meyerhof is the founder of Children of the Earth (COE), a worldwide organization that inspires, connects, and empowers youth working for peace both locally and globally. A school administrator with a doctorate in Educational Policy, Research and Administration focused on self-esteem, Nina worked as Vermont’s Special Education District Coordinator for 17 years and wanted to put her philosophies into action. In 1970, she established Heart’s Bend, a values-oriented children’s summer camp on her 120-acre farm that she ran for 30 years. She became deeply inspired by youth-led action resulting from empowered youth that she worked with. In time, she came to recognize the need for children’s voices to be present in world forums, and in 1990, founded Children of the Earth (COE), a UN NGO non-profit organization. Its mission was to offer young people around the world an opportunity to realize that personal empowerment leads to inner peace that then fosters outer peace. Launching COE transformed Nina’s career and she has since become a foremost educator and pioneer in uniting global consciousness among the world’s youth. Nina’s innovative work in peace and sustainability through educational methodologies has reached young people in over 60 countries, and continues to grow. Nina co-authored the book, Conscious Education: The Bridge to Freedom; developed a one of a kind handbook entitled, Pioneering Spiritual Activism, grounded in methodologies that she created – Reflect, Connect, Act, which constitutes a learning process designed to consolidate spiritual growth and societal actions. Nina is also recognized among educators for having developed two constructs called Conflict-Transcendence, which goes beyond conflict resolution and Lateral Leadership Governance Structure for working in groups. COE youth have formed Social Action Chapters and Spirit Youth Hubs in over 30 countries that focus on local peace initiatives, environmental concerns, educational programs, economic opportunities and spiritual development. COE sends out an online bi-monthly newsletter detailing the organization’s activities and individual youth stories to over 7,000 people. COE youth projects have reached over 15,000 individuals and COE chapter and hub members are active on social media sites. COE has been bringing youth together for 23 years, providing community and networking opportunities to young leaders who are committed to positive global changes; and this work continues to grow. COE’s goal is to support and link a network of young leaders as a global family committed to actualizing their personal intention, becoming inspired to altruism and weaving a web that bridges all personal, cultural, national and religious divides. At the age of 71, Nina is still building her legacy by launching the next phase of COE. Throughout her journey, she has developed, published and put into practice, educational models and training materials grounded in spiritually-based consciousness for peaceful, ethical living, youth-led action and leadership for a better world for all. The key, critical moment that, for Nina, transitioned her life and work with Children of the Earth into high-gear, was September 11, 2001. On that day, Nina was in attendance at the International Day of Peace at the United Nations. When tragedy unfolded amidst the chaos, debris and terrorizing uncertainty, Nina had only one thought: “We need to take care of the children…” Nina resolutely focused in on the center of chaos and the needs of the children. She headed towards Ground Zero and with indefatigable determination presented her UN badge and entered the nearby Armory Building. She immediately she put out calls for help. Confusion, panic and fear were all pervasive as people desperately sought information about their loved ones. Within 24 hours Nina and others set up the ‘Kids Korner’ in the Armory Building, designated for people and their children to sit, access services, information and receive comfort. Donations of essential items poured in, along with items of comfort such as teddy bears, which Nina saw both children and adults cling to. The comfort the bears gave became the source of inspiration for COE’s ongoing Teddy Bear Project, where teddy bears were delivered to orphaned children in areas of devastation such as Haiti, New Orleans, Indonesia and Rwanda. The impact of Nina’s work is seen far and wide around the world. The Children of the Earth organization is one of many avenues Nina has worked to help transform human consciousness for over two decades. Nina’s book has been translated in 5 different languages. Her educational curriculum for peace, multicultural, global and spiritual models have been delivered throughout the world. She has held workshops, seminars, and training sessions on her innovative teaching for youth and adults around the world. 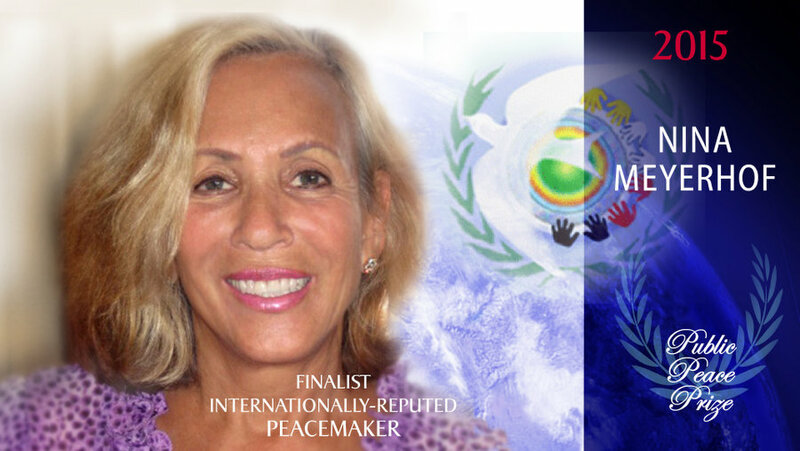 She has served on global efforts such as the drafting of the Universal Peace Declaration of Costa Rica and is a Council member of the Evolutionary Leaders to purposely serve conscious evolution, and which includes members like Neale Donald Walsh, Deepak Chopra, Michael Bernard Beckwith and Barbara Marx Hubbard. only 10% need to come to the awareness that they hold the power to positively change our world. Nina believes that the 21st Century holds the greatest possibilities for an integrated peaceful and prosperous global community from among the hearts and minds our world’s youth. sciences to make a conscious jump in evolution; they simply need the space and support to make it happen. COE, through this Movement, will hold the space for young people to evolve our world on a massive scale. In closing, while Nina’s story is one of true global leadership, stories of action from youth that she has inspired is truly remarkable. Here is a sampling of youth projects and global forums Nina brought youth groups to, respectively. Peter from Uganda developed a beekeeping teaching project for women in his village. His business is now becoming a sustainable source of income for the community. Ashfaque from Pakistan, learned meditation in Thailand, returned home and shared his experience with others by meditating in a local park. He befriended a woman who was blinded when lye was thrown in her face. Instead of using money he was saving for a trip to the US, Ashfaque gave it to the woman so she could go to the hospital. Nina publicized his story, which inspired a donor to sponsor his trip. Mark from Toronto, hosts a monthly youth spirituality meeting inviting teachers from other religions (Catholic, Buddhist, Native etc.) to share as they practice their own religion. Vandy from Sierra Leone, attended the 1990 International Leadership Program at Heart’s Bend Camp. He was later awarded the Human Rights Award at the Hague Appeal for Peace in Holland for organizing youth to drop their weapons and seek peace. He is now a COE Board Member. Jimmy from Nepal, built an educational center and 12 schools with a grant that serves both boys and girls in remote mountain regions where children didn’t have schools or the schools had been destroyed by bombs. Christian from the Philippines, whose father died in a typhoon, secured school supplies to share with impoverished children. After school, the children plant trees for reforestation to prevent future mudslides. Lawrence from Ghana witnessed his father’s murder, later met the killer in a refugee camp and forgave him. Lawrence helped establish The Apeadu Children’s Peace Center in Ghana that brings young people together to learn peace-building skills. COE will hold a workshop and retreat here in the summer of 2013.
and 25 youths and adults to Nepal for workshops and cultural exchanges. held a workshop in Jordan on Common Bond MidEast Dialogue, leading Jordanian, Lebanese, Palestinian and Israeli Jews through her process of transcending conflict. and attended the UN International Day of Peace in New York City. Is the real deal who works for Peace She has “raised” thousands of young people in leadership, spirituality, and peace activism. You have my vote. And my heart. You deserve my vote! !god bless you mama Nina! Nina is a dear friend, mentor and colleague. She is an inspirational woman of calibre and a visionary for peace, spirituality and human transformation. Nina, you have my vote! With all my blessings for a better world in peace. Thank you Nina for all the hard work you have done to inspire more youth every day to life in peace. With all my gratitude , you have my vote! Few are as committed, effective and loved. No one is more dedicated to the cause of world peace than Nina. Her devotion to the cause is legendary. Voting for Nina, voting for peace. Nina Meyerhof is an amazing ambassador for peace and transformation in our world. Her work inspiring youth has impact that will resonate for generations to come. She has been and still is a major inspiration for me in all that I do. Nina- may your dedication shine on – For the grace bestowed – may all ” children of the earth” multiply in love. We cannot change the past, but if we all work together and with our wonderful youth worldwide, perhaps we can mold the future so they can “thrive”! !